BUILT-IN SUBWOOFER STEREO SOUNDBAR: 38-inch 2.0 channel audio, built-in 2 full range powerful speakers and 2 bass diaphragms, LED display screen in the front and sensitive buttons on the right side. Wotmic soundbar will provide you an amazing deep bass stereo audio experience throughout your home. EXTRA VOLUME OUTPUT: With the inner 30W power amplifier (of which can reach 60W MAX), this Wotmic Soundbar can deliver greater volume level than other 30w soundbars, advanced 60W audio drivers allow you easy to fill the 160-320 sq ft rooms with crisp and clear stereo sound. 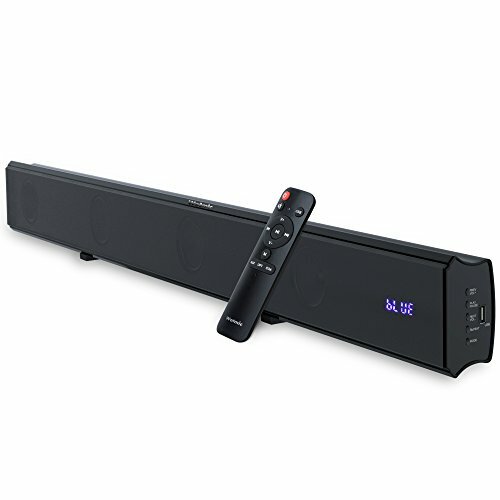 This Wotmic Soundbar can help you enjoy TV Shows/ Gaming Scene/ Music in the most comfortable way. CONTROL WITH BUTTONS OR REMOTE: Comes with a high-sensitivity full function remote controller to control the soundbar speaker. Connect the Sound bar to your TV with one of included cables in the package. It's a perfect partner for LED/LCD TVs. WALL MOUNTABLE OR TABLE STAND DESIGN: There are wall mount kits on the back of the sound bar and you can hang it upon the wall, or sits flat below the TV screen, can save room space. This wotmic soundbar is a good choice to decorate the home or home theater. Easy to take it off and just make it stand on the table or when party needs. If you have any questions about this product by Wotmic, contact us by completing and submitting the form below. If you are looking for a specif part number, please include it with your message.